As Priest-in-charge at St Stephen Walbrook I am regularly called on to tell the story of how this English 17th-century masterpiece by Wren acquired a modern altar by Henry Moore complemented by a circular re-ordering and further commissions from Patrick Heron, Hans Coper and Andrew Varah. This story, which raises many of the key issues involved in modern and contemporary commissions, begins with war damage caused by bombing raids during World War II. Former Rector, Peter Delaney, notes that most of the fittings were burnt or destroyed in these raids and it meant that, during restoration, seating and altar arrangements could be thought out again. The Rector at the time, Dr Chad Varah, and the people of St Stephen had engaged in a major social outreach programme by founding Samaritans in 1953. This charity seeks to help people that want to commit suicide by providing a telephone helpline for those in distress. As a result, they took the restoration as an opportunity to express their theology of how they saw the gospel in relation to their community. Wren’s buildings mirrored the theology of his day. Delaney writes that the Church of England as a reformed Catholic church reflected the English attempt to keep the main threads of sacramental life but with a new twist of being able to hear and see everything which went on in the church building. Wren designed and built auditory churches, where no member of the community would be more than thirty feet from the action. However, for Varah and his congregation, the 17th-century placing of the altar away from the people with the priest standing with his back to the congregation no longer expressed what they felt to be the immanent nature of the God they worshipped and served. Thus Henry Moore conceived a centrally placed altar made of travertine marble cut from the very quarry which provided the marble for Michelangelo’s work. By carving a round altar table with forms cut into the circular sides, Moore suggested that the centre of the church reflected the Dome of the Rock in Jerusalem, commemorating the sacrifice of Abraham and Isaac as a prefiguring of the sacrifice of Jesus Christ. It also was the place for the offering of the Eucharist at the heart of Christian worship. This place was designed for people to gather as a community around the altar where God could be found at the centre. Circular seating was then commissioned from Varah’s son, Andrew, and dazzling abstract kneelers, delineating the sanctuary, from Patrick Heron. Aesthetically and theologically, these commissions involved significant change to a Wren masterpiece. The issue for all concerned was whether such significant changes were incongruous to the design of Wren’s building or could in some way complement or harmonize with Wren’s original design. The significance of this question was such that this debate took place in ecclesiastical courts, which first prevented and then, on appeal, allowed the commission to proceed. The Henry Moore commission at St Stephen Walbrook, therefore, brings into focus some of the key issues and questions regarding modern or contemporary commissions. In 2014 I explored these issues and questions through a sabbatical art pilgrimage which involved visits to significant sites connected to the renewal of religious art in Europe during the twentieth century. In Europe I have visited some of the sites connected with the groups of artists surrounding Maurice Denis, Jacques Maritain, Albert Gleizes and Père Marie-Alain Couturier, while, in the UK, I primarily visited sites which highlight the influence of innovatory commissions undertaken by Bishop George Bell and Canon Walter Hussey. These were issues with which I had already begun to grapple as secretary to commission4mission, an arts charity encouraging churches to commission contemporary art. Henry Moore undertook three ecclesiastical commissions in his lifetime. The first was a Madonna and Child for St Matthew Northampton. This sculpture was commissioned by Canon Walter Hussey, who later wrote that it had been the great enthusiasm of his life and work (both at St Matthew and as Dean of Chichester Cathedral) to commission the very best artists he could. A major debate in modern and contemporary ecclesiastical commissions is the extent to which commissions should be given to the best artists of the day regardless of faith commitment or to artists who focus more consistently on ecclesiastical commissions. The Dominican Friars, Couturier and Pie-Raymond Régamey famously argued in the pages of L’art Sacré that "each generation must appeal to the masters of living art, and today those masters come first from secular art." That was the approach used at St Stephen Walbrook in commissioning Moore, Heron and Coper and it is an approach which gained significant prominence in modern and contemporary ecclesiastical commissioning. It paid dividends at St Stephen and was, no doubt, of help in enabling the appeal regarding the Moore altar to succeed. However, Benedict Read (1998 lecture to the Royal Society of British Sculptors - http://www.fleischmann.org.uk/frrefe.html) has rightly noted that there also exists an alternative world of ecclesiastical commissioning using artists for whom such commissions are a primary focus which, while it doesn't feature in the notion of cultural history in the post-war and later periods posited by art historians, is often no less effective for that. On my sabbatical art pilgrimage, I viewed a substantial number of such commissions by such artists, often mediated by sacred art groups, of which commission4mission is one today. Debates about artists with significant mainstream reputations versus those without, and between secular artists and artists who are Christians represent false division and unnecessary debate. The reality is that both have happened simultaneously in the story of modern church commissions and both have resulted in successes and failures. Couturier criticized the Ateliers d'Art Sacré, an early sacred art group established by Denis and George Desvallières, as a 'world closed in on itself, where reciprocal indulgence, or else mutual admiration, quickly becomes the ransom paid to work as a team and maintain friendship.' Yet Couturier's scheme of work at Notre-Dame de Toute Grâce du Plateau d'Assy suffers from the opposite problem, as work by individual masters produced in isolation from each other, with work assigned on the basis of what they could with integrity contribute, resulted in a decorative scheme with no cohesiveness or focus. 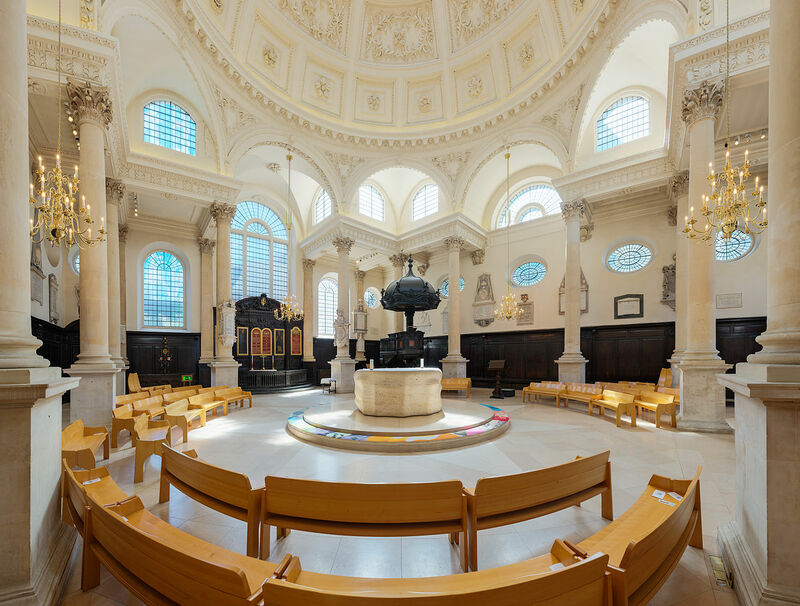 By contrast, at St Stephen Walbrook the commissions given to Moore, Heron and Varah were specifically focused on realizing and enhancing the scheme for reordering the space aesthetically and liturgically. The key is focused curation of commissions, rather than the preeminence of the artist’s reputation. This focus at St Stephen on enhancing the scheme for reordering the space aesthetically and liturgically also reflects a difference of approach from that used in some modern churches and cathedrals. Basil Spence famously described Coventry Cathedral as a plain jewel casket filled with many jewels. In other words, the building is architecturally plain - essentially a white rectangle - with the aim that this simplicity and minimalism will show off the artworks to best effect and that the significance and impact of these works will bring the building to life as a place of worship. By contrast, the desire to preserve is at its strongest when a church is built as a complete, integrated artistic and architectural unit in a particular style, such as Wren’s English Renaissance design for St Stephen Walbrook. This means that, in the most extreme circumstances, no development or new commissions are permissible because to do so would detract from the original design. St Stephen Walbrook does demonstrate, however, that it is possible to sensitively introduce artworks of a different period and design into an existing and coherent scheme. Focused curation of commissions must, therefore, address issues of harmonisation versus dialogue or dissonance. This relates particularly to commissions in settings where there is existing artwork/architecture and concerns the extent to which the new commission is integrated with whatever is already there. Artworks integrated within the life and architecture of a church are not viewed in the same way as works within the white cube of a gallery space and this needs to be understood and handled with sensitivity during the commissioning process. The result can be a sense of overall integrity and harmony within a space which holds great variety and diversity. In relation to St Stephen Walbrook, while significant change and incongruity was introduced by the Moore commission, the circularity of the design and reordering mirrored the dome under which it was to be set and this does enable the modern commissions to harmonize with Wren’s design. Additionally, the reordering can be seen as an extension to Wren’s concept of an auditory church, where no member of the community was a substantial distance from the action. The focus at St Stephen on enhancing the scheme for reordering the space aesthetically and liturgically also reflects a move in ecclesiastical commissioning from narrative figuration in stained glass (e.g. commissions by Marc Chagall or Thomas Denny) to the creation of spiritual space using abstract design (as pioneered particularly by Jean Bazaine and Alfred Manessier in using stained glass in French churches). The concept of stained glass architecture - of a light-filled architectural unit – that we find for example at the Chapelle Sainte-Thérèse-de-l'Enfant-Jésus et de la Sainte-Face in Hem (France), is an attempt to create spiritual space – a sense of prayer and a glimpse of heaven – through the play of light and colour within the building. In the past churches were centres for the drama of the visual: the drama and spectacle of the liturgy combined with the visual narrative of scripture in stained glass. Now people find their visual stimulation elsewhere – through the media primarily – and, as a result, churches have become centres for the opposite of visual stimulation, e.g. centres of visual contemplation where narrative is less essential than ambience and atmosphere. (iii) Germaine Richier’s Crucifix was removed from Notre-Dame de Toute Grâce d’Assy and a subsequent instruction on sacred art issued by the Sacred Congregation of the Holy Office in 1952 was the beginning of a severe constriction of the modernizing programme of the French Dominicans. This represented a victory for the traditionalists within the Church. Many church commissions, like those at St Stephen Walbrook, are controversial because they introduce something different and therefore dissonant into a familiar building. Harmonization can, as we have seen, help to minimize this sense of dissonance and difference, but with some works their value derives from the sense of dissonance they create. That was certainly the case with those images of the crucifixion by Servaes, Richier and also Graham Sutherland (at St Matthew Northampton and St Alban East Acton), which viewed Christ’s sacrifice as emblematic of human suffering in conflict and persecution. These were often controversial as they challenged sentimental images of Christ and deliberately introduced ugliness into beautiful buildings. I spoke to parishioners in both Northampton and East Acton who stated that they did not like Sutherland’s Crucifixions, but who also appreciated why the paintings were as they were and the challenge that they provided as a result. I was particularly moved to find on entering Sint Martinuskerk in Latem that the baptistery contains a Passion charcoal by Servaes. Servaes and Richier were both affected by decrees from the holy office, which led to the removal of their artworks from the churches for which they had been commissioned. Servaes, with his Stations of the Cross and altarpiece for the Carmelite Chapel in Luithagen, and Richier with her crucifix for the church at Assy. Given all that Servaes experienced in the controversy over the Luithagen Stations, including the removal of work which was a genuine expression of his faith by the Church of which he was part, I found it profoundly moving that a work of his, in the same vein as the Luithagen Stations, should be displayed in the church and area where his faith and art first fused. Richier’s crucifix has been returned to its place in the sanctuary at Assy and the church, like many other art sacré churches, is classed by the Government as a national monument and has become a significant tourist location. It seems, therefore, that scandals of modern art, whether the reception of the works themselves or that of their challenging content, are with time resolved as congregations live with the works and learn to value the challenge of what initially seems to be scandalous. This would also seem to be the experience at St Stephen Walbrook where, despite the concerns expressed in the ecclesiastical court cases about the incongruity of introducing the Moore altar into Wren’s building, parishioners and visitors alike view the Moore, Heron and Varah commissions as being congruous with Wren’s design. To sum up on the basis of my sabbatical art pilgrimage, my experiences through commission4mission and the example of St Stephen Walbrook, I would suggest that the Church has often not valued sufficiently the artworks it has commissioned. At times their significance has not been understood or shared, at other times the works have been controversial and may have been banned or not publicized as a result. Often the artworks have been regarded as subsidiary to the liturgy and have not been publicized in order that the focus of the faithful would not be deflected. ‘Christian Art’ has become a contested term and the Church has been unsure whether to continue to use it and, if not, how else to speak of its commissions. There has also been significant debate about the relative values of commissioning artists who are Christians and contemporary ‘masters’ who may not be Christians. In terms of the mainstream art world, the beginning of the modern period saw art and artists firmly and finally separating from dependence on Church patronage and wishing to maintain that independence. In addition, the speed with which new movements formed within modernism meant that artists engaging with church commissions in their later career could be portrayed as no longer being cutting edge and as having declined in the quality of their work. Many of the media used for Church commissions have not been central to modernism’s movements, while the ‘alternative world’ of artists for whom Church commissions are a significant part of their practice tends not to feature on the radar of the mainstream art world. Each of the above is open to question and critique. Controversy over commissions tends to fade leading to more widespread acceptance. Controversy can also generate valuable debate. The place of icons in Orthodox Churches shows that artworks can enhance rather than detract from worship. Commissions have gone to artists who are Christians and to contemporary ‘masters’ who are not Christians throughout the modern period. There are examples of successful and less successful commissions using both approaches. A mixed economy is the only practical and realistic approach. Commissions should be judged on their own merits and not on the reputation of the artist(s) involved. Reputations change over time meaning that those who are viewed as contemporary ‘masters’ may not be considered as significant by future generations, while artists who do not have national or international reputations in their day may nevertheless produce high quality and/or visionary work. The quality of work produced by artists does not necessarily diminish with age or a change of style, although the reputation of an artist or the perception as to whether they are or are not cutting edge may be affected by such considerations. The commissions I have seen and of which I have been part speak powerfully and movingly of the Christian faith and therefore inform the spirituality of those who see them. It is my contention that to tell more fully the story of the engagement of the Church with modern and contemporary art, can encourage more and better commissioning. It can also have the effect of providing emerging artists from within the Church and the faith with a greater range of role models and approaches for their own developing inspiration and practice.